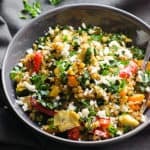 Buckwheat Stir Fry Recipe with cooked roasted buckwheat groats, kale, pepper, marinated artichokes and optional feta cheese for a healthy 30 minute dinner. In a medium pot, add buckwheat; rinse and drain with cold water a few times. Add 3 cups water and a pinch of salt. Cover and bring to a boil. Reduce heat to low and cook for 15 minutes. Do not open the lid. Remove from heat, let stand for 3 minutes and fluff with a fork. In the meanwhile, preheat ceramic non-stick wok on medium heat and swirl 1 tbsp of oil to coat. Add garlic and sauté for 10 seconds. Add kale and 1/4 tsp salt; sauté until shrunk in half, stirring occasionally. Transfer to a medium bowl. Return wok to high heat and swirl 1 tbsp of oil. Add peppers and 1/4 tsp salt; sauté until golden brown, stirring occasionally. Transfer to a bowl with kale. Reduce heat to low and add remaining 2 tbsp of oil. Add cooked buckwheat and briefly stir it to coat in oil. Turn off heat. Add previously cooked kale and peppers, artichoke hearts, parsley, basil and remaining 1/2 tsp salt. Stir gently and serve warm. Store: Refrigerate in an airtight container for up to 4 days. ★ Did you make this recipe? Please give it a star rating in the comments.